The Midas Gas Detector by Sieger uses reliable sensor technology to detect the many key toxic ambient and the flammable gases in a plant. The device monitor points up to 100 feet (30 meters) away while using patented technology to regulate flow rates and ensure gas detection error-free. 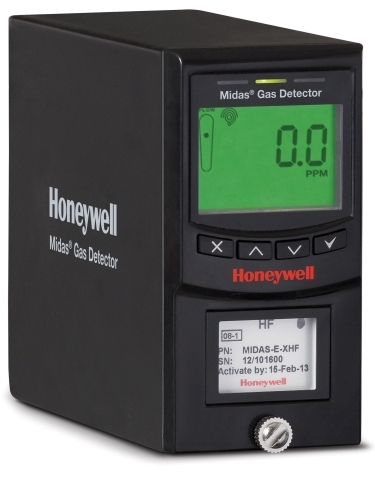 Use of advanced robotics, the Midas Gas Detector use of advanced robotics thanks to Honeywell's offers unbeatable quality and reliability. Improved visibility and ease of use: The Midas Gas Detector is equipped with bright LED lights and an interactive interface, intuitive and that provides instant alerts as alarm levels to gas readings. Also included in the interface is the protected menus as password for calibration, tests and configuration. Easy installation: Compact in size with a metal chassis that is easy-to-handle, the Midas Gas Detector is simple to install. This is especially important owing to the crowded, complex process environments where space is at a premium. The Numerous applications: This includes aerospace, light industrial manufacturing, semiconductor processing, waste water, university laboratories and more.